A Connecticut man who was captured this week after spending nearly five decades as a fugitive will ask authorities in the state of Georgia to commute his 17-year prison sentence for armed robbery, his lawyer said on Friday. Robert Stackowitz, 71, was arrested on Monday by the U.S. Marshals Service at his home in Sherman, Connecticut, attorney Norman Pattis said in an interview. Officials learned he had an arrest warrant when he was applying for Social Security benefits. Stackowitz escaped from a prison work camp in Carrollton, Georgia, on Aug. 22, 1968, according to the U.S. Marshals. A mechanic who was allowed to work freely on school buses at a nearby facility, Stackowitz ran away and flew to Connecticut, where he quietly worked - sometimes under an alias - in a variety of jobs, Pattis said. Among his occupations were school teacher, auto mechanic and owner of a boat repair business. "I don't know whether the computer networks that we take for granted now for background checks were as sophisticated then as they are now," Pattis said. Stackowitz lived with a woman who later died and has an estranged daughter from a previous marriage, the lawyer said. Today, Stackowitz suffers from medical ailments including congestive heart failure, diabetes and bladder cancer, Pattis said. 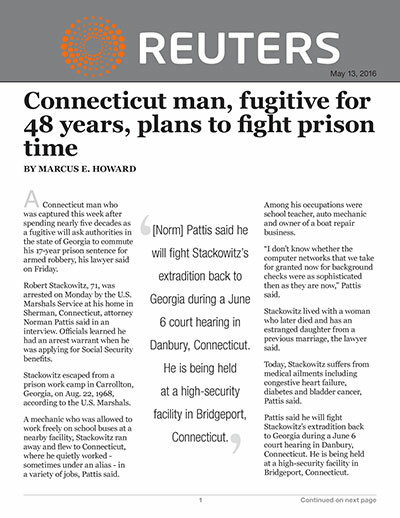 Pattis said he will fight Stackowitz's extradition back to Georgia during a June 6 court hearing in Danbury, Connecticut. He is being held at a high-security facility in Bridgeport, Connecticut. "Someone who is in that type of condition - I don't know how they'll get him to Georgia," said Pattis. "It would kill him." Stackowitz also plans to ask the Georgia Board of Pardons and Paroles in a letter to commute his sentence due to deteriorating health, said Pattis. The board said in a statement that it will consider all information, "including the circumstances of his arrest, conviction, escape and his conduct during his 48-year fugitive period." If the board rejects Stackowitz's request and no additional prison time is added, he would have about 14 years left to serve, said Pattis. Stackowitz was originally involved in what was supposed to have been residential burglary, which turned into an armed robbery when the home owner returned and was prevented from leaving, the lawyer said. Stackowitz and his co-defendants were captured and convicted in 1966.